Deserving of its own listing rather than being lost as an insert, this deep,cherry red, virtually unspotted form of L. maritimum helps to show the wide range of colors and forms found within a species. From the dusty red "type" to this nearly spot free cherry-red, to the equally unique golden-orange. 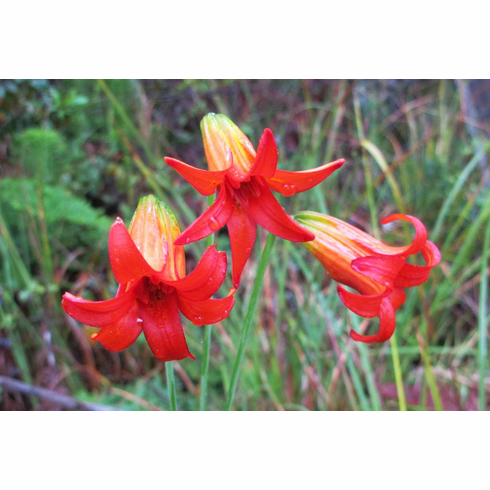 Rare in nature and even rarer in cultivation because of its near impossible requirements, this lily is native to the coastal areas of Northern California. Found sometimes just above the high tide mark, it grows in sandstone soils that usually flood sometime during the year. The pendant, bell shaped flowers are orange-red in color, blending to yellow and finally green at the top. Photo of L. maritimum>/I> taken in natural habitat by Asa Spade in Mendocino County, California. Copyright Asa Spade, all rights reserved. Used with permission.